PHILADELPHIA — Which Met can you handle seeing less of in the near future? And no, we don’t mean the easy picks, like a Jason Vargas. This is a toughie. Because the options are going to be Pete Alonso, J.D. Davis, Jeff McNeil and Dominic Smith. Not a fun list, we know. And why do you have to choose? Well, let’s rephrase that. You don’t have any say in the matter. Neither do I. 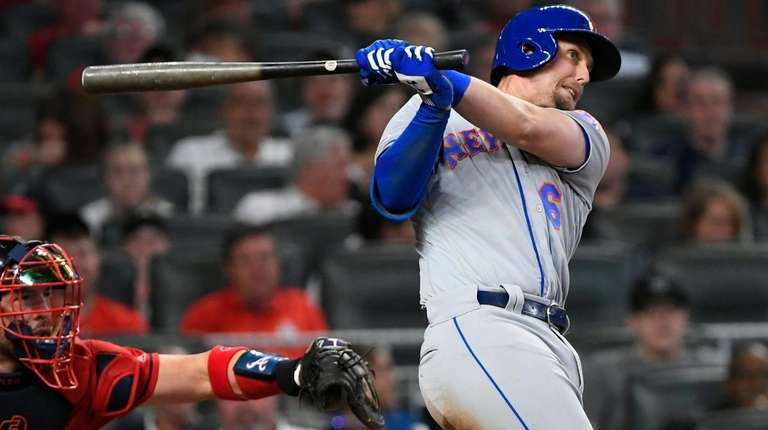 But Mickey Callaway, the guy at the most public end of the string-pulling, is going to be sitting some of the Mets’ best young players on a more consistent basis very soon once Todd Frazier rejoins the team, which will be any day now. Frazier is winding down a lengthy rehab stint for a strained oblique that has kept him sidelined in Port St. Lucie since the end of a spring training that he barely participated in. But as a player who is earning $9 million this season, and a former client of the current GM Brodie Van Wagenen, it’s not as if Frazier can just simply disappear, stashed away like the Flushing version of Jacoby Ellsbury. Callaway reassured us before Monday’s game that he doesn’t consider Frazier to strictly be a bench player, even though he won’t be reclaiming his previous role as the starting third baseman, either. So what is Frazier? The way these Mets are winning with their young guns, he shapes up as a potential disruption. Even Callaway admits the Frazier equation will be difficult to solve. With a crowded infield, it’s simple enough to keep Jeff McNeil in left. That’s not an issue. McNeil entered Monday tied for eighth in the majors with a .383 batting average (18-for-47) and ranked fifth with a .463 on-base percentage. Where it gets complicated are the corner infield spots, the domain of Alonso, Davis and Smith. The Mets’ original blueprint for the season — after signing Jed Lowrie — pegged Frazier as a third baseman who would provide insurance for the unproven twenty-somethings at first. But Alonso already is looking like a Rookie of the Year favorite with his must-see at-bats, and he entered Monday ranked fourth in the majors in both slugging percentage (.800) and OPS (1.219). While the Mets have benefited from Alonso’s prodigious start, Smith is getting burned by it just as he’s begun playing up to his potential. Smith had played in all 15 games, but made only two starts, hitting .444 (8-for-18) with two doubles and four RBIs in his limited time. Having the mighty Alonso in front of him is basically an immovable road block. With those two dug in, the Mets should hang a no-vacancy sign at first base. They’re good. And across the diamond, McNeil and Davis were holding down that spot, too. Which is why Callaway revealed Monday that the Mets intend to start using Davis in the outfield to clear some space at third for Frazier, then presumably Lowrie. Let’s not worry about Lowrie just yet because he’s not close enough to coming back. But using Davis in the outfield has repercussions as well, like giving McNeil a seat or even Michael Conforto. Players need an occasional breather, even young ones. But not too often, especially when they’re rolling. The Mets have always needed depth, and these situations do tend to work themselves out, usually with an injury or two. But if there is a loser in this positional derby, it’s got to be Frazier, who is coming off a season where he batted .213 with a career-low .693 OPS in 115 games. At 33, Frazier may be resigned to the role of providing veteran leadership, even if these kids seem to possess a maturity that matches their talent level. And we want to see more of them, not less.